Get the look you want without the hassle of natural stone. Porcelain tile offers a distinct beauty, versatility and durability that homeowner’s demand, at a price anyone can afford. Harder than ceramic, and less porous than granite, travertine or limestone, porcelain tile is stain resistant, water resistant and can hold up to a family’s abuse. 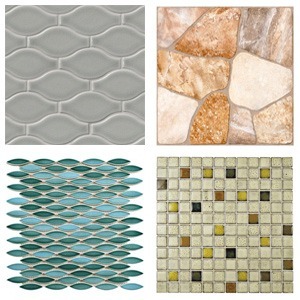 Plus, it offers a variety of colors, sizes and designs to allow you to create the look and feel you want for your space. Good for use in any area of the house, porcelain tile is great for bathrooms, kitchens, laundry areas, foyers and more. 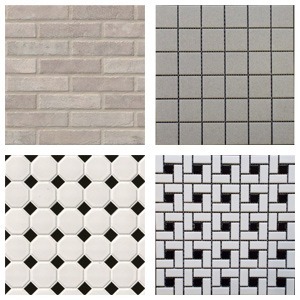 Available in a variety of shapes including small and large squares, rectangles, subway style, hexagon, penny rounds, and brick, porcelain tile can be used for either a casual or more formal look. Add a decorative design using mosaics or patterned tiles to showcase your personality for a unique space that is all your own. Made to fit the style and tone of any room, porcelain tile can be used on the floors, walls or fireplaces. Today’s modern offerings even boast a subway-style look and a wood plank look that gives you the feel of real hardwood and the versatility and durability of tile. Great for high traffic areas, porcelain tile is easy to clean, maintaining its look for years to come. Whether you want a sophisticated formal look, or a fresh modern one, porcelain tile can help you showcase your unique style and create a space that is comfortable, yet beautiful, providing the function today’s business household needs, without sacrificing the stunning beauty you crave.